While my blog was being transferred over from WordPress to my own site this past week, I took the opportunity to create a new website for our eBook, Steve & i. The URL is: www.steveandi.com (click on it to view it). To my published author friends: besides badgering your friends and family until they can’t stand you anymore, what are some of the best ways you’ve reached your readers? If you have any tidbits you wouldn’t mind sharing, I’d love to hear them! Thanks for all your support everyone! Learning the ropes has been quite an adventure! The book is off to a great start…and that’s all because of you. 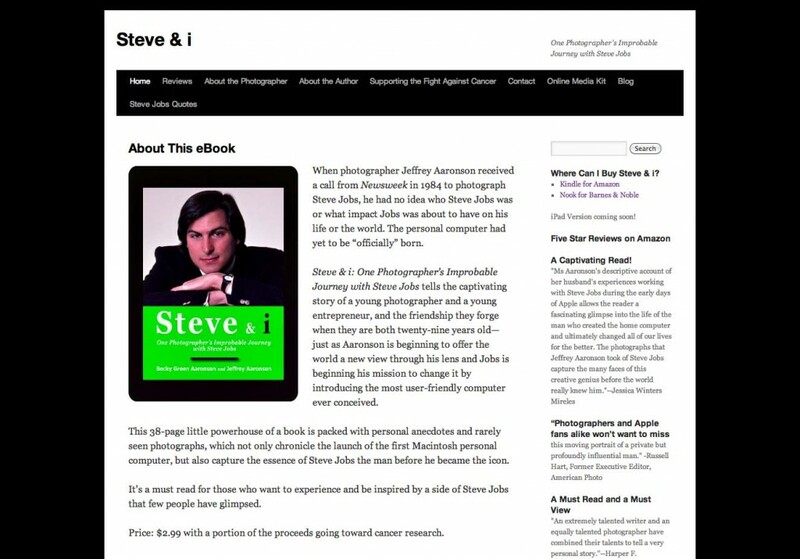 This entry was posted in Photography, Writing and tagged apple, book marketing, ebook publishing, ebooks, epublishing, kindle, Steve & i, Steve and i, Steve Jobs, website by Becky Green Aaronson. Bookmark the permalink. Becky, The site is looking great. Best wishes to you & Jeffrey . Love it. It looks so great! Thanks, Jessica. I appreciate your two cents. I have a couple more ideas up my sleeve for it to spice it up a bit more. Now if Apple would be so kind as to put it in their store, we’ll be very happy! So now you have another site, too? What fun! Small steps! It’s fun to do all this stuff, but a few more hours in the day would be helpful!